Visit our stand at the fair Sicam in Pordenone, Hall 4, booth A20/B21 October, from 13th to 16th. 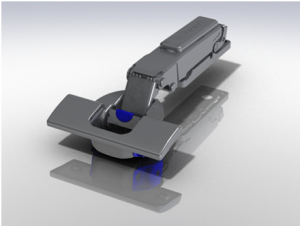 We are glad and proud to present the new hinge “SINTESI”, with integrated damper fixed on cup. The 20th Kitchen & Bath China will be held on June 3-6, in Shanghai, China. Our booth will be in pavillion 8.1 aisle A30-B31. From march 28th to April 1st we’ll be exhibiting in Interzum GuangZhou (China). We’ll be in pavillion 14.1 Stand E03. During Sicam Pordenone the last update of F-1 Box double wall drawer has been revealed, and it is now available in the market.